IANS|| Two CRPF men killed in an ambush by Maoists in Chhattisgarh’s Sukma district were cremated on Tuesday with full state honours at their native places in Himachal Pradesh. A crying Class 11 student told reporters present at the cremation that the family only received a phone call about her father’s death. Sanjay Kumar, who served with the Central Reserve Police Force for 27 years, is survived by his parents, wife and two daughters. “It is a proud moment for us and for the country,” the trooper’s father Rajinder Prasad Sharma, however, said. He too had served in the CRPF. 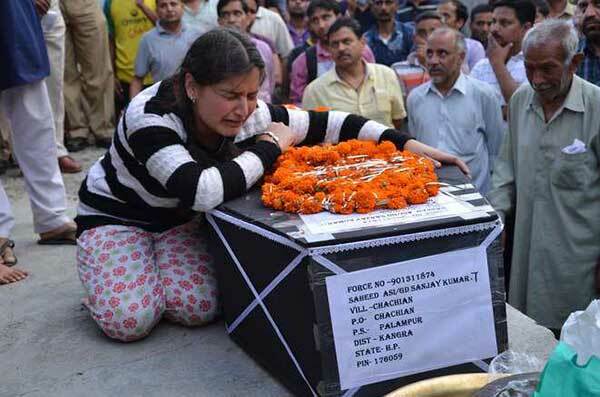 CRPF Head Constable Surender Thakur, 33, too was cremated at Nerchowk town in Mandi district. He had rejoined duty after a break of two weeks on April 10. His family said after hearing of the ambush on news channels, they tried to contact him on phone. Someone who answered their call informed them of his death in the ambush. Thakur is survived by his wife, a three-year-old daughter, an elder brother and mother. He was posted in the CRPF in 2003 and served in Jammu and Srinagar for six years. In Chhattisgarh, he was posted for three years. Governor Acharya Devvrat and Chief Minister Virbhadra Singh have condemned the Maoist attack. State Bharatiya Janata Party leader Prem Kumar Dhumal stressed the need to strengthen intelligence to prevent recurrance of such incidents. Twenty-five troopers of the CRPF were massacred on Monday by Maoists in Chhattisgarh.